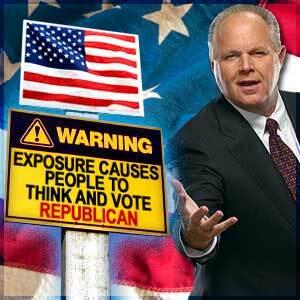 RUSH: I can’t avoid this. No matter where you look, John and Elizabeth Edwards — I should say Elizabeth Edwards is all over the news. In the Chicago Tribune, ‘Democrats pledge support for wide access to abortion.’ Okay, here’s how the story opens. ‘Elizabeth Edwards said Tuesday that her husband’s health-care plan would provide insurance coverage of abortion. Speaking on behalf of Democratic presidential candidate John Edwards before the family planning and abortion-rights group Planned Parenthood Action Fund, Edwards lauded her husband’s health-care proposal…’ who’s running here? Is Edwards running? Is the Breck Girl running, or is his wife running? Does he speak at all? Actually, Snerdley and I were talking about this, and we think these two are running a pretty deft strategery themselves here. Like Edwards goes out, as candidate, he says, ‘Ah, I’m not comfortable around those people, gay marriage.’ The wife goes out to a gay pride parade in San Francisco, ‘Ah, I’m all for it, John’s got some problems, but I’m all for it.’ So they take care of it that way, and she leaves, cover both sides of the issue. Okay, that’s the Chicago Tribune. From the Associated Press, ‘Elizabeth Edwards tells voters her husband,’ the Breck Girl, ‘is a tough guy who can stare the worst in the face and not blink, in an ad set to start airing Wednesday in New Hampshire. Elizabeth Edwards appears in the ad that the campaign hopes will highlight the couple’s marriage.’ So Elizabeth says that John is going to make sure abortions covered insurance-wise. Elizabeth says that John is tough. You get to the Washington Post, and Edwards defends his anti-poverty tour. He has to be on defense? He’s having to defend it? We have audio sound bites of much of this. In fact, we have had ad, we have audio of the ad of Elizabeth Edwards saying that John, her husband, the Breck Girl, is a tough guy. ELIZABETH: I’ve been blessed for the last 30 years to be married to the most optimistic person that I’ve ever met. But at the same time, he has an unbelievable toughness, particularly about other people, and that is his ability to fight for them. You’re not going to outsmart him. He works harder than any human being that I know, always has. It’s unbelievably important that in our president we have someone who can stare the worst in the face and not blink. EDWARDS: I’m John Edwards and I approve this message. RUSH: Uh, the worst in the face. Is she talking about the bathroom mirror every morning? I’m sorry, Dawn, I’m sorry — unkind — unkind. We’re not supposed to comment on people’s physical appearance. Okay. Last night, Hardball with Chris Matthews, his guest is John Edwards. A little montage here of Matthews gushing about Elizabeth Edwards while interviewing the Breck Girl. MATTHEWS: Let me ask you about your wonderful wife, Elizabeth Edwards. Of course, her name is Edwards, as you know quite well. One of our golden oldies here, that’s the wonderful Elizabeth Edwards talking on the telephone with — well, I’ll leave no adjective here — Ann Coulter. EDWARDS: Well, I think it’s not shocking that my wife is for me. I’m proud to have her support. I hope I get her vote, too. No, I think the point she was making, I actually talked to Elizabeth this afternoon about this, I think the point she was making is, if you look at things like poverty, there are more women in poverty than there are men, there are more women who don’t have health insurance than men, there are more women who are affected by the minimum wage than men, and in these kind of substantive areas that have a direct impact on the lives of women, I’ve been very aggressive and I’ve been out front and leading on those issues. EDWARDS: It surprised me a little bit, but I’m not shocked that a lot of people, and particularly a lot of people Democrats liked the fact that Elizabeth was standing up to this woman and this hatemongering. Go Elizabeth, is what I gotta say. You know, I appreciate her having some backbone and courage, and somebody’s gotta speak out when these people get — use the kind of language that this woman’s been using. RUSH: I mean, someone has to speak out, and it’s going to be my wife. Somebody’s going to speak out, and it’s going to be my wife. Not to mention the fact this whole Ann Coulter thing was — they were getting mad at her about something that was typically taken out of context by people, but that’s par for the course. All right, so Matthews then asks this question. MATTHEWS: What’s it feel — I’ve never been poor, you have, all right? I’m not talking about the haircuts and all the nonsense. I’m talking about your own personal experience as a human being. You know what it’s like to be poor. Tell the people watching right now who haven’t been what it’s like. RUSH: Can you believe this? This is what I don’t get. This guy has exhibited expertise on nothing. Here’s the answer. We’re going to listen to it together. I haven’t heard it. EDWARDS: You go into a restaurant with your family and you sit down and everybody, and especially when you’re young — that’s the only time I was poor, Chris — and you sit down, and then we — you start to — to order something, and your father says, ‘We have to leave because we can’t pay for this,’ and you get up and leave, and it’s — it’s humiliating, or it feels humiliating when you’re young and it’s particularly humiliating to see your mother and father have to go through that so we don’t want to see anybody treated without dignity or respect in this country, which is part of what motivates me to this cause. RUSH: Yeah, we’re supposed to believe that they walked into a restaurant with no money. They walk into a restaurant with no money or very little money and then they’re surprised that there is a price next to every item on the men, say, ‘Oh my gosh, they charge here. Why, we’ve gotta leave.’ I’m sure. I just don’t buy this. Before you even get to that, you have to say, wouldn’t they know, by virtue of where they’re going, whether they can afford it or not? Why walk into someplace. If you’re poor, you gotta be near home. You’re certainly not traveling around. You gotta know your surroundings. You gotta know where you can afford what. If you only can afford a lawn mower, why would you go to a Mercedes dealership? There’s something about all this, folks, and what is being treated with dignity? The guy that owned the restaurant was supposed feed them for nothing? Who humiliated anybody in that circumstance? This is also not about poverty. This is about liberalism, pure and simple. One final thing. This is a little bit of a discussion here, a montage, actually, Chuck Todd who is the NBC News political director, used to run the Hotline out there, and he was talking with one of the anchorettes, one of the info babies and he said, ‘Elizabeth’s verbal attacks on Hillary Clinton is certainly making the headlines today. Is Elizabeth overshadowing the campaign?’ And here’s a montage of the NBC political director’s answer. TODD: Elizabeth Edwards does seem to be the one Edwards who can consistently make headlines. She seems to be almost the more compelling figure right now in the Edwards camp. I think what the campaign likes when she goes on the attack is because she is a sympathetic figure and people generally seem to like her, it’s hard to push back at her. If she attacks Hillary Clinton, Hillary Clinton is not going to come and attack her. TODD: And it’s something that the campaign knows it can get away with for a certain amount of time. The question is, is there a point when Elizabeth Edwards maybe steps across some sort of imaginary line where she’s going too far? RUSH: The question is, is there a point where Elizabeth — Apparently not, because nobody’s going to hit back. Too much sympathy out there.